If you think the main themes from Benjamin Britten’s The Young Person’s Guide to the Orchestra and Henry Purcell’s Rondeau from Abdelazer Suite are similar, you’re right. Purcell, a Baroque composer, wrote incidental music in 1695 to accompany performances of the play by Aphra Behn, Abdelazer, also known as The Moor’s Revenge. The second movement of the 10-movement suite is one of Purcell’s most recognizable tunes and was the inspiration for Britten’s work. It’s easy to draw parallels between Emmanuel Chabrier’s Espana and Nicolai Rimsky-Korsakov’s Capriccio espagnol, pieces that the Evanston Symphony Orchestra will perform on February 4 at 2:30 p.m. Both were written about the same time in the 1880s and draw on the music and culture of Spain. But there is another similarity: Neither composer was actually Spanish. Huapango remains the most famous work of José Pablo Moncayo, the Guadalajara native and a pupil of Aaron Copland. While visiting Alvarado in Veracruz, Moncayo was inspired by the folk music he heard. The melodies and rhythms proved difficult for him to capture, as the musicians never performed the folk dance the same way twice. He still managed to complete the composition, which was met with great acclaim; it served as the foundation of a new movement of Mexican nationalism in music, and is considered by some as the unofficial second national anthem of Mexico. Joaquin Rodrigo, blind since the age of 3 due to diphtheria, moved to Paris at 26 to study with Paul Dukas in 1927. After marrying Turkish pianist Victoria Kamhi in 1933, Rodrigo returned to Paris to study at the Conservatory and the Sorbonne. He came back to Spain only after the end of the Spanish Civil War in 1939. Three times is clearly a charm. The Evanston Symphony Orchestra welcomes for the third year in a row to its Holiday Concert the popular Evanston Symphony Holiday Gospel Choir led by Rev Ken Cherry. The choir will once again sing a gospel version of Handel's Hallelujah Chorus at the Dec. 10 concert at 3 p.m. at Evanston Township High School. 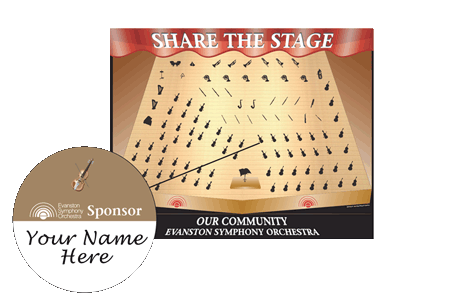 The ESO in 2015 commissioned the orchestration of this piece, with funding from the Evanston Arts Council, so this performance and piece are uniquely and specially Evanstonian! Read more about Sing Hallelujah! It wouldn’t be the holiday season without the sound of Christmas carols in the air. This year’s program will include traditional works like Ding Dong! Merrily on High and We Three Kings, as well as new spins on old favorites, with gospel versions of the Hallelujah Chorus and Silent Night. The latter was originally made famous by The Temptations, and this version for full orchestra and gospel choir was arranged by the Evanston Symphony’s Music Director, Lawrence Eckerling. Founded in 1997, the Evanston Dance Ensemble’s mission is to deepen the exposure to and appreciation of dance for highly talented and committed young performers and diverse audiences in the greater Chicago area. We’re excited to have them back to celebrate the holidays with us. This year, you’ll enjoy new choreography from Bea Rashid and Christine Ernst during the Scene in the Pine Forest and Waltz of the Snowflakes from The Nutcracker. Premieres are not necessarily auspicious events. That certainly seemed to be the case for the debut of Jean Sibelius’ Violin Concerto in D Minor — the composer’s only concerto. As the son of a publisher and a well-read, studious fellow himself, the young Robert Schumann was interested in being a writer. When he realized his true passion was music, he instead became the only one of four brothers to quit the family publishing business, building a successful career as a composer, pianist, and music critic. Even so, he never forgot his literary roots, and showed a particular zeal for setting written works to music. Like the Fifth and Sixth symphonies, Beethoven’s Seventh and Eighth are a set of “untwins,” contrasting works created basically side-by-side. Beethoven completed Seventh Symphony in 1812 and premiered it and his Wellington’s Victory, or The Battle of Vitoria, in December 1813 at a fund-raiser for soldiers wounded at the battle of Hanau. In between, the program featured marches by other composers where the orchestra was accompanied by a mechanical trumpet-playing machine, created by Johann Malzel, who also invented the metronome.